When I opened my WordPress Account this morning and click some notifications, I was surprised to know that 4 days ago I am in my 5th year in blogging. 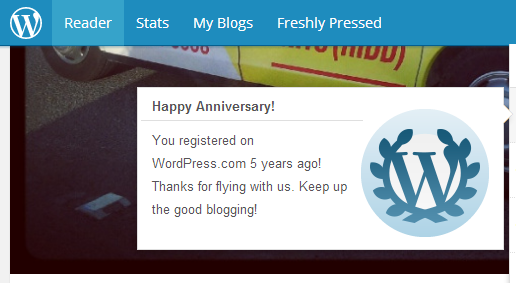 I can’t believe I almost missed my 5th Year Anniversary in blogging. March 16, 2008 when I published my very first post in WordPress. It is indeed a milestone for me, Five years of sharing my feelings, thoughts, experiences, everything about me, being an OFW, family life. As much as I want to update my blog, It is impossible for me because of my very hectic sched. I was trying to squeeze my time in work, family, business, sidelines in 24 hours. I just hope I can find time to share my stories. I terribly missed blogging. I’m thankful to those people who still visiting my blog despite luck of updates. I hope you find something useful in my blog. Glad to have 123,555 visitors up to this date. ← My Baby is now a Lady!